Greetings fellow associates! 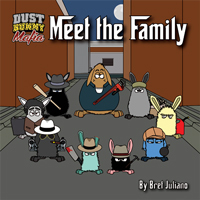 For those of you who haven’t heard yet, the Dust Bunny Mafia was working overtime the past few months creating some great things in addition to the regularly scheduled comic. The main thing we’ve been doing is illustrating up to our ears for the Unlawful Good Anthology. What is the Unlawful Good Anthology you say? The Unlawful Good Anthology features the talents 35+ creators in a crime themed collection of comics. This is a 160+ FULL COLOR paged collection of original crime-themed stories, featuring some of the greatest under the radar creators (like me!) in comics! What exactly did I contribute to the Unlawful Good Anthology you ask? I created a series of 6 criminal advertisements featuring the Dust Bunny Mafia crew, dealing with topics such as guns, ordering hits and money laundering. Here’s a really small sneak peek of what’s in store for you in the anthology, featuring Leo the Boss and Leadfoot Lucy. Now go buy it and tell ’em Jimmy sent you!